The warm summer feel of Southern California is starting to trickle in after a long series of rain storms. The warm evening breezes and flowers blooming had me thinking of the beautiful landscape of Hawaii. And of course, since my mind is always on Disney, Hawaii made me reminisce on one of my favorite Disney movies: Lily & Stitch! 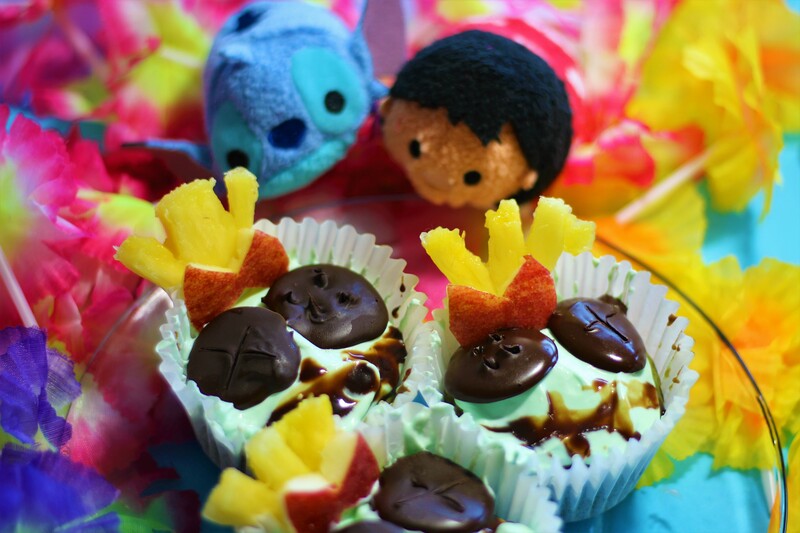 I have yet to make a recipe centered around Lilo & Stitch, so I thought it was about time! I created cupcakes that are “clean eating” cupcakes, that look like Lilo’s doll Scrump…so I present to you, SCRUMPCAKES! Mix together flour, salt, baking powder, and sugar. In a separate bowl, whisk together milk, oil, vinegar, and vanilla. Combine your wet and dry ingredients, add in 2 drops of green food dye to make it look minty green, stir. Pour into cupcake liners and bake for 20-25 minutes. Time to make your frosting! In a bowl mix your cream cheese, maple syrup, and one drop of food dye (to look minty green). Time to make Scrump’s eyes! In a small saucepan, heat 1 cup of Enjoy Life dark chocolate chips with 1 Tbsp coconut oil, and stir till melted. Once melted, place 12 drops of your chocolate on a plate, and put in freezer for 5 minutes. Once gooey, draw an X on half of your button chocolate eyes, and draw button wholes on the other half. Then place in the freezer for 15 more minutes. Using apple slices or strawberries, use a paring knife to cut the shape of bows. With your paring knife, cut out the shape of Scrump’s hair from pineapple. Once your cupcakes are cooled, frost them. Then top with button eyes, bow, and “hair”. Using leftover melted chocolate from your chocolate chips, place in a squeeze bottle to draw on Scrump’s mouth. In a seperate bowl, whisk together milk, oil, vinegar, and vanilla. Time to make Scrump's eyes! In a small saucepan, heat 1 cup of Enjoy Life dark chocolate chips with 1 Tbsp coconut oil, and stir till melted. With your paring knife, cut out the shape of Scrump's hair from pineapple. Once your cupcakes are cooled, frost them. Then top with button eyes, bow, and "hair". Using leftover melted chocolate from your chocolate chips, place in a squeeze bottle to draw on Scrump's mouth.